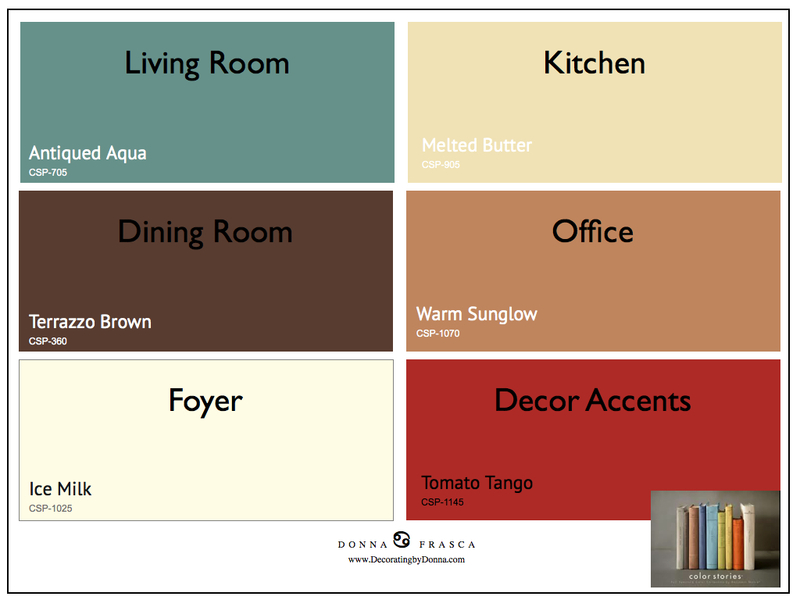 Color Trends: What Colors Are We Really Using in Our Home? When it comes to color, there are colors that are magazine pretty and the rooms look gorgeous then there are the colors that we actually put in our homes. 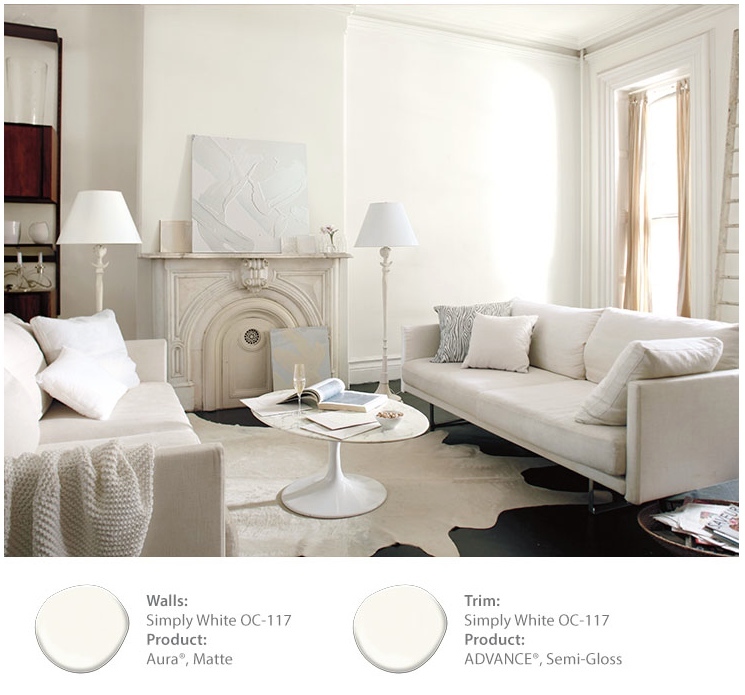 Benjamin Moore just chose Simply White for their Color Of The Year but honestly, how realistic is that to live with? I posted comments on facebook when Simply White was released as Color of The Year by Benjamin Moore and the consensus was this. or Artists who used this color in their art studio. Where were the families with kids and pets? Cricket, cricket, cricket. That young families with children and pets would NOT use or have an entirely white living room. It’s just not realistic. Is it pretty? Sure but keep in mind that our homes are dwellings in which to LIVE in and as we all know, dirty things happen when there are kids and pets around. Oh and not to mention the occasional football party. Would the Mrs. love having Mr’s friends over for the game in this living room? No. So after all this white, this naturally brings me to color. What colors are we actually using in the home? Well for now, my clients are still gravitating to the blues, grays and don’t like green of any sort. That’s sad but I keep pushing the envelope and offer all kinds of beautiful color combinations but they just don’t have that comfort zone yet – which is fine. Someday they will. So what colors are we really using in our homes? Well I think you know that, it’s the color palette that’s really close to the coastals with all the blues and grays that you can feast your eyes on. Are they pretty? Well of course they are but so. over. done. already. BUT – they will NEVER go away, well maybe eventually but not anytime soon. Color palettes for most paint companies have already been chosen. These were my pics for 2016 which many you see in the Sherwin Williams Color Forecast for 2016. Came really, really close! Meanwhile, I’m going hot and heavy with color and for 2017, it’s going to be this. I don’t want to see blue or gray in any way, shape or form. The bluest I would like to see is this pretty color by Benjamin Moore and it’s Antiqued Aqua. Here’s how you can use these colors. Oh and by the way, the last element I added to this graphic was the Color Stories logo – see it on the bottom right? Look at the color of the books? Almost the same colors I have just chosen here. Quiet the coincidence don’t you think? What’s really great about this color palette is that you can take any two of these colors and put them together for a great look. How about Tomato Tango and Ice Milk for the kitchen? Oddly, both food related colors. Terrazzo Brown and Ice Milk for a Master Bedroom. Antiqued Aqua and Sunglow for the Family Room. The list and go on and on and on. The point of this post is to start using COLOR in the home. No more blue. No more gray. No more white. Will everyone agree with this color palette? Of course not. But that is with any color palette you show, there will be people who love it and people who don’t. So, in closing, how about we have “Color PALETTE of The Year” instead of just one color? 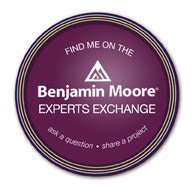 This entry was posted in Benjamin Moore, Coastal Colors, Color, color expert, Color Stories, Color Trends, Holistic Colors, Trends and tagged benjamin moore, Color Stories, simply white. Bookmark the permalink. 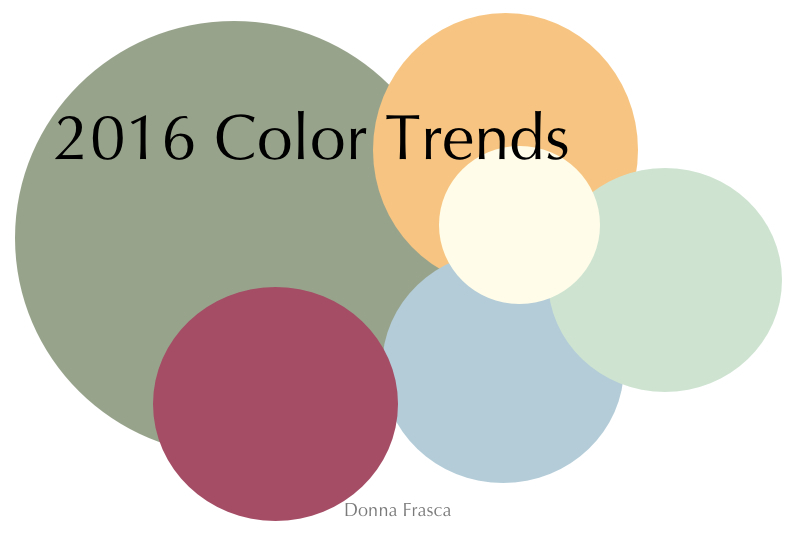 20 Responses to Color Trends: What Colors Are We Really Using in Our Home? I love the idea of having a Color Palette of the Year rather than Color of the Year!!! Color is all about context anyway. A great color doesn’t necessarily look great just anywhere. I must say though, that blue IS a color and I think you have a very personal aversion to it which must be why you dog it so much. There are so many versions of blue that work so well in relation to other colors like those in your palette above, I don’t think banning it altogether is the answer for most people. 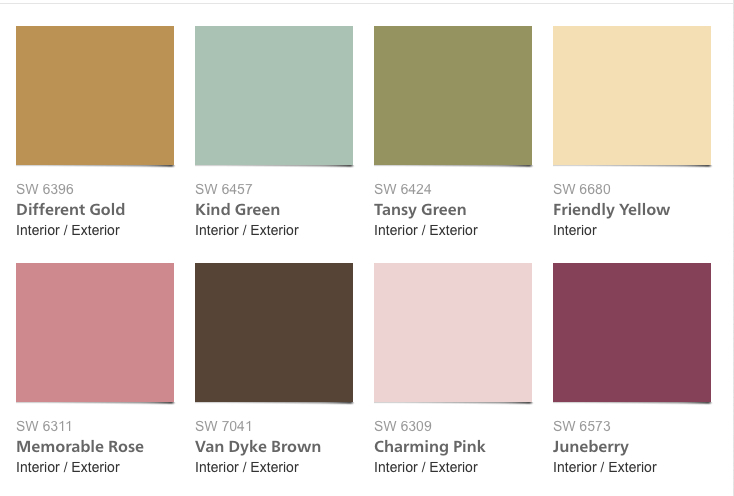 Hi Kristie – I love the idea of a color palette of the year – this way there is something for everyone instead of everyone dogging one color, lol. As far as blue, it’s not that I don’t like it, I was raised on the beaches of Long Island and it just doesn’t get any prettier than that. It’s just that I’m tired of people using blue and gray all the time because they don’t know that there are other options. Coastal colors are gorgeous! The more Designers like you and I start posting about color in a different way for the home, the sooner everyone will consider new looks for their home instead of what everyone else has. I found you over at The Decorologist, and I had JUST written a post about my utter despair at a world gone gray. Anyway I’ll never get over blue, but I like this post regardless! HI Joey, thanks for stopping by. The Decorologist is a great website. About gray – nope – can’t do it. It’s one color that I will never put in my home HOWEVER I have no problem designing a blue-gray color palette for my clients. Personally, for me, gray is just so lifeless. I’d love to read your article about gray – I’ll so see if I can find it. Simply white is a stunning colour. Yes white is a colour. It makes my home look like an art gallery. Expanding the space, bouncing natural light off the walls makes this a contemporary space. Anyone can do colour few have the guts to understand white! Colours come and go. Yesterday’s green is yesterday’s green. But white is classic! Where can I find the antiqued aqua? The number is on the graphic Michael – is that an awesome color? That is by Benjamin Moore in the Color Stories Collection. Wow, Donna I generally don’t post comments but this time I just had to. I am redoing my home (started late spring) and your new colors are so in line with my antique aqua, brown and milk with tomato living room, dining room (navy, aqua, some couple of punches of tomato, sunglow) and kitchen (milk, sunglow, tomato) and entryway: still a work in progress but tomato, milk, brown. So was super psyched and amused to see your new colors. Do I love coastal, absolutely, I’ve had a coastal scheme of some variation for over 20 years. Nothing is more soothing for the psyche than the coast. Plus the ocean has every possible shade of blues, greys and greens and add sand and driftwood shades and you have infinite options. That’s how I moved into the aqua, brown and milk and sunglow tones. I dropped the greys and moved into warm vs cool palette. BTW the tomato was due to that ubiquitous red lighthouse that seems to pop up in so many coastal scenes. Interesting feature Donna, I added a link from our Facebook page. I hope that’s okay with you. I am a traditional beige/off-white prison who has a chance to change all that! 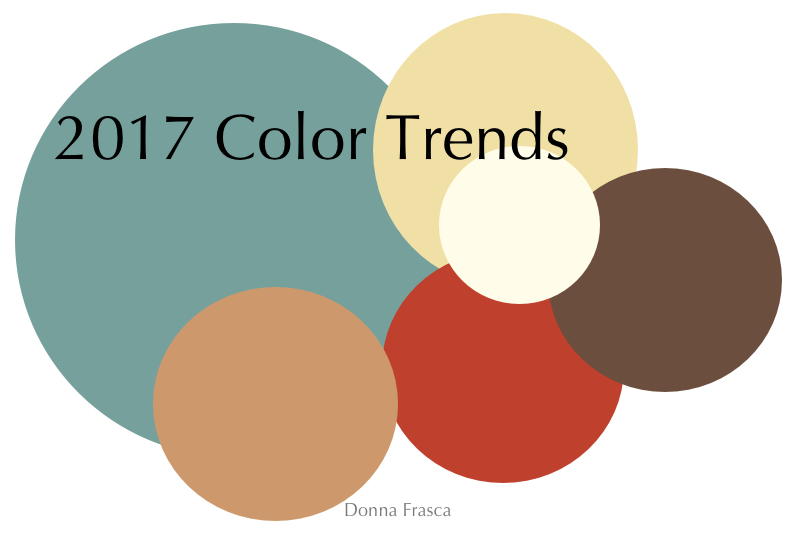 I love your 2017 Color Trends! Just haven’t figured out what to do with the knotty pine in my long, kitchen/den area. I’d like to paint, but husband doesn’t want to mess the wood up. It’s SO dreary looking to me! Thank you, Donna! My ceiling is painted white now, so may think about painting a wall. I still like your 2017 color trends! I’m so excited to have found your website! Looking forward to exploring and will be reaching out in a couple of months for some color consults. I’ve been burned by trying to guesstimate myself on what will work, so the thought of having a talented professional (who isn’t afraid of COLOR!) is so reassuring! Happy New Year! Well happy new year to you too! Would a Terrazo brown accent wall in a dining room/living room with ice milk as a main wall colour make a room look cold or warm? Love your 2017 trends! As long as your main walls are light it should be ok. Make sure your fabrics and decor are light and bright as well oh and connect the undertone of that brown wall with your flooring and furniture in that room.